In preparation for the holiday season, new Gateway artist Hannah DeFelice is hard at work producing a vast number of holiday related cards, creches, and menorahs. After finalizing a last detail, DeFelice smiles and proudly declares another unique and intricate menorah complete, and ready for a customer. Once each hand crafted item is finished it travels from the second floor studios to the street level Gateway Store to be sold. 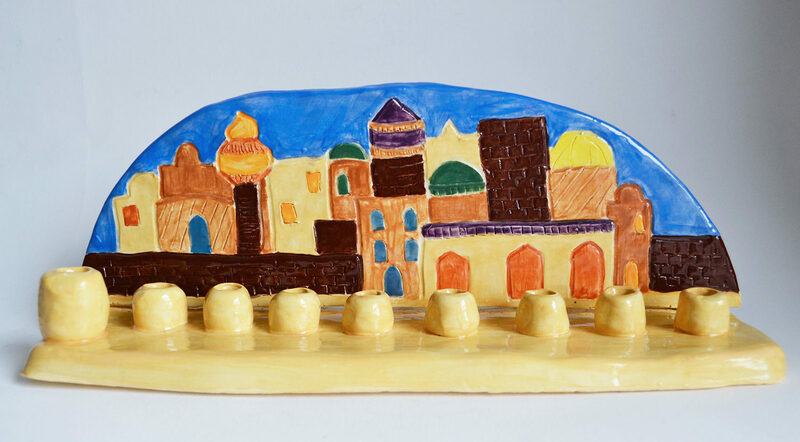 Image Description: A hand crafted ceramic menorah, with nine candle placements in the foreground, and a painted and etched representation of the Jerusalem skyline in the background. Like many of Gateway’s gifted artists, DeFelice has found professional career support for her entrepreneurial spirit here in the studios. She enjoys making work in a diverse array of mediums; pottery, clay, watercolor, fabric, and drawing among them, and is readily inspired with new ideas. Self-motivated and proactive, DeFelice succeeded in harnessing her talent and skills to satisfy a captive consumer audience this holiday season, selling a dozen handmade menorahs within the week they hit the shelves of The Gateway Store, which is located at 62 Harvard Street in Brookline Village. In the studios Gateway artists have access to high quality materials, as well as artistic critique and skills-building with a staff of professionally trained artist supervisors. Like other professional artists, they receive the industry standard 50% commission for the sale of their work. DeFelice’s work, alongside the work of the 100 unique and dynamic artists working at Gateway, will be available for sale at Gateway’s 45th Annual Holiday Fair on December 1st. Celebrating 45 years of supporting meaningful lives and careers in art for people with disabilities, Gateway Arts is Boston’s best kept secret for truly unique, and meaningful holiday shopping.